Blog - Page 2 of 4 - ACES, Inc.
ACES, Inc. CTO Tony Alletag will be presenting on “DevOps and Government Contracts” at the upcoming DevOps DC Meetup Tuesday Nov 15th @ 6:30PM at Excella Consulting in Arlington VA.
Government contracts typically do software development on isolated networks without access to the internet. This causes many significant challenges to software developers that are used to having free access to all the tools, libraries, and experts that are available there. This talk will go over real examples on how government contractors are using DevOps. ACES, Inc. was recently awarded a multi-year prime contract for software development with a goal of transitioning legacy enterprise products, algorithms, and analytics to a modern data processing architecture that utilizes big data streaming and analytic technologies. We will be building out a lab for specialized hardware design, testing, staging and assembly of prototypes for mission systems. We are looking for founding team members to help grow a DevOps culture and be part of the next generation of processing tools for this customer. 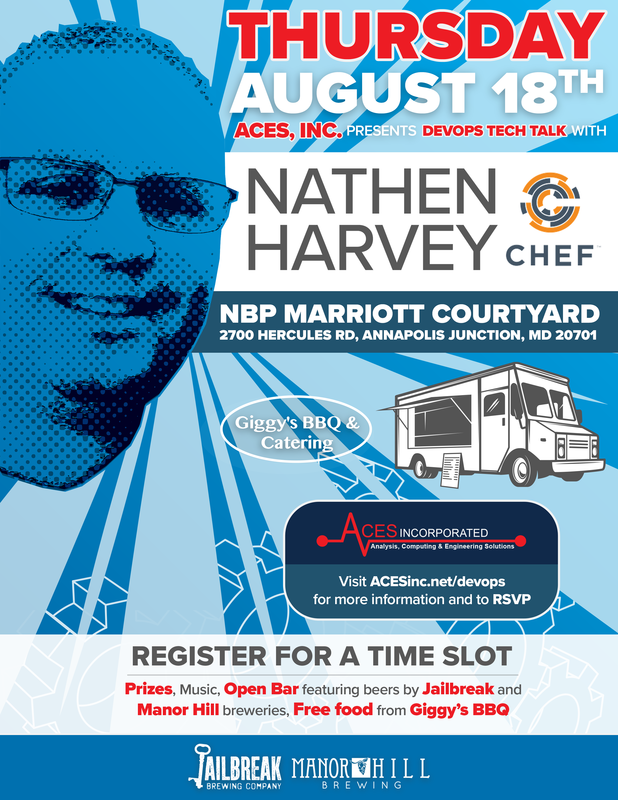 ACES, Inc. wanted thank everyone that came out for our DevOps social especially Nathen Harvey. Nathen gave a great talk on DevOps to around 30 people and the event was enjoyed by all. Interested in learning more about DevOps? Come join us for our ACES, Inc. DevOps Social on Thursday, August 18th after work. Nathen Harvey, the Vice President of Community Development at Chef will be speaking. To read more about Nathen and DevOps click here. Feel free to invite your friends and co-workers, but please make sure to RSVP here to reserve your spot. We hope to see you there! 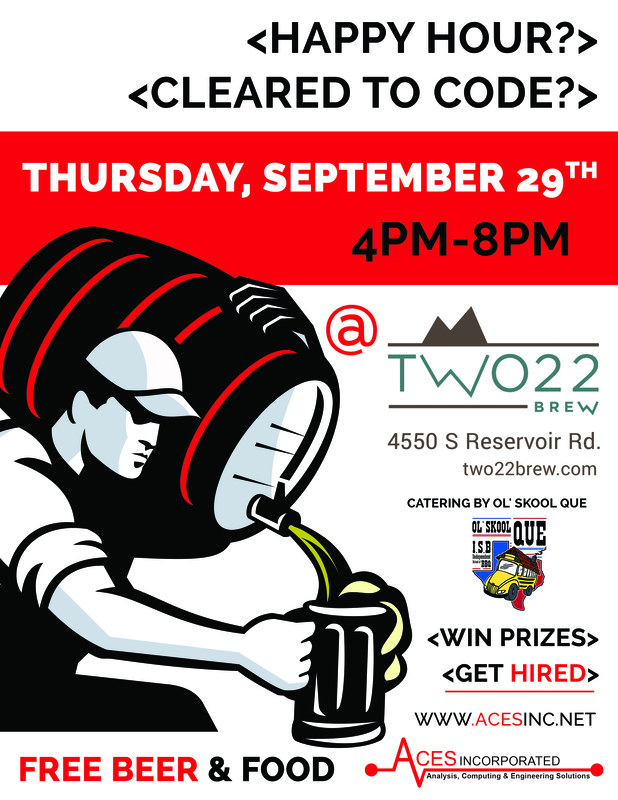 Happy Hour for all ACES, Inc. employees from 3-7 at Jailbreak Brewery! We’re donating to the fundraiser while also raising awareness of the Ellicott City flood victims. Come out, socialize, and support a great cause! I have been a Government contractor and software developer for over 15 years. I have worked on projects where code wasn’t shared with anyone outside the development team to open source projects funded by the government (Ozone Platform). The Federal Source Code Policy could be monumental for advancements in technology and innovation by empowering open communication and collaboration with the largest producer of software in the world. This post is the third in a series of blog post that will discuss Ozone evolution from a widget framework to a software as a service platform. The goal is to generate discussion among the Ozone community to discuss challenges and possible solutions. This post is the second in a series of blog post that will discuss Ozone evolution from a widget framework to a software as a service platform. The goal is to generate discussion among the Ozone community to discuss challenges and possible solutions.